Readers sound off on Solano Stroll, Bawdy Storytelling, and California's tax policies. This is a brilliant example of why we need long-form journalism: cogent analysis, historical background, and factual documentation. It puts our local newspapers and The Bay Citizen to shame. As a journalist who covered California when Brown was governor the first time and the Howard Jarvis Taxpayers Association was in the ascendancy, I found everything I needed to know since then about the sad state of California. It also mirrors what Obama is doing nationally — as trends in California often lead the country — but that might be too long for even me to read. Thanks for continuing to do this kind of journalism. I'm going to nominate this piece for a journalism award. I was in agreement with the piece until Darwin BondGraham began railing against the California sales tax and motor vehicle tax as "regressive." This childish, knee-jerk attitude and its attendant fantasy that we should all be rich are delusional. But more important, attainment of this fantasy would wreak extreme environmental and ecological destruction and would cause the end of life as we know it in a very short time. My main objection is the author's characterization of the motor vehicle tax as regressive. This would only be correct in the narrow view that everyone should be driving an SUV, or even driving at all. Real progressives, and anyone who truly cares about the environment, have long advocated for replacement of private motor vehicles with walking, biking, and public transit. Driving causes extreme environmental destruction, such as global climate change and oil spills like those in the Gulf of Mexico and the Yellowstone River. The harder and more expensive it is to drive, the more people will demand and use public transit and other alternative modes of transportation, and they will also demand cities and towns whose design supports and allows use of alternative transportation. Real progressives don't want driving to be cheap, we want it to be as expensive as possible. As to sales tax in California, considering that food (including all sorts of highly processed junk food) and medicine is exempt from sales tax, and no one pays sales tax on rent or mortgage, what's mostly being taxed are luxuries. There's nothing regressive about doing this — in fact it's rather progressive. Overconsumption is one of the root causes of environmental and ecological harm. The more expensive it is to buy unnecessary things, the less people will consume and destroy the earth. Perhaps the exemption for sales taxes should be enlarged to include basic clothing, but other than that there's nothing regressive about this tax either. Darwin BondGraham's comments strongly indicate that he's of the all-too-common mindset that we can have our cake and eat it too. This fallacy is present in both the left and the right, and leads to very harmful policies. The fact is that all of our actions have consequences, and the consequences of human overconsumption (which includes consuming things we should not, like oil) are destruction of ecosystems, immoral killing of plants and animals, and massive pollution. We can't have it both ways and we need to make a choice: Will we simplify our lifestyles and live in a way that doesn't harm the planet, or continue our highly destructive lifestyles that are ruining everything good about the earth? Advocating against taxes that would reduce needless consumption puts people who do so in the latter group, unfortunately. Good article, but needs a bit more balance in that leaders, progressive or otherwise, can best lead in the direction voters seem to want to go. I agree that public opinion polls in the last year in California have been suggestive of support for increased taxes, especially on the super-wealthy, but I don't see community groups pressing for the same — perhaps because the media is obsessed with sensational stories? In addition to leadership, more high-quality activism is needed — and/or needs to be heard of — to return California to the progressive policies that yielded the dividends which we all continue to enjoy and made us proud to contribute to. It worked with redistricting! In your excellent article this week on California's fiscal mess, you discuss many problems stemming from Prop 13. And you correctly describe Oakland's parcel taxes as regressive taxes that require every single-family homeowner to pay the same, regardless of property size or value. However, the problem with Oakland's parcel taxes is not due to Prop 13; if that were the case, other cities in the area, including Berkeley, would be in the same position. As it is, numerous other cities manage to impose parcel taxes that are prorated based on size and/or value. Oakland's inability to do this appears to be based on administrative shortsightedness and incompetence in record-keeping that would allow the parcel tax to be calculated in a more equitable fashion. This can and should be fixed, but I have found city councilmembers unwilling to address the issue every time I've asked about it. 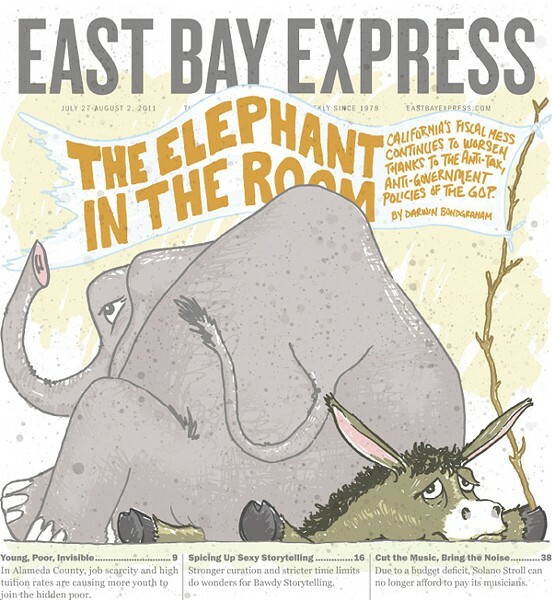 Excellent article, and I'm very sorry to hear that the Solano Avenue Association can't find it in their budget to offer musicians even $50 each to lug their heavy equipment up and down Solano Avenue, and provide people with the high-quality, beautiful music that the communities of Albany and Berkeley and El Cerrito have come to expect. I hope that Ellis Island Band and Failure to Disperse will find more deserving and appreciative festivals in the Bay Area. I hope that the Solano Avenue Association will reconsider its miserable decision to stop budgeting for music at the Stroll.